4Easysoft TS Converter is an outstanding TS Video Converter, TS Video Creator and TS file editor, so it can convert TS to other videos, create TS file from all popular videos, and edit your TS files easily. 4Easysoft TS Converter can upgrade your video/audio effect. So you can trim, crop the video by dragging and dropping the slide bar, add watermark by inputting pictures or texts, get one successive video/audio from several video/audio clips, perfect video quality by adjusting the video Contrast, Saturation, Brightness, Deinterlacing and so on. 4Easysoft TS Converter doubles your enjoyment with joining several interesting clips into one. 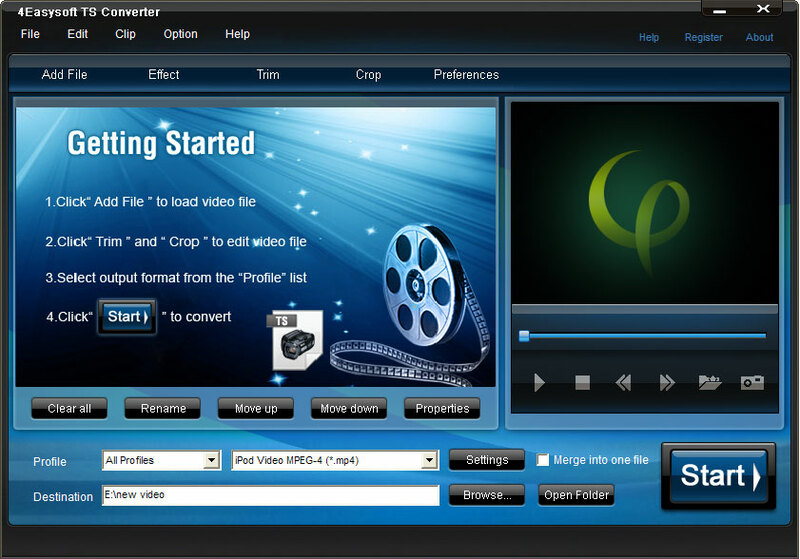 This TS Converter allows you to set the video Brightness, Contrast, Saturation. Checking Deinterlacing helps you to convert interlaced video to the progressive video, this function can optimize the video effect. With the assistance of 4Easysoft TS Converter, you can upload your TS video to YouTube, put TS file and other videos on iPod, iPhone, Apple TV, PSP, PS3, Xbox 360, Zune, Archos, Sandisk, iRiver, Creative Zen, MP4/MP3 Player, Smart Phone, Pocket PC, Mobile Phone, etc. Crop frame size to remove your unwanted area using TS Converter like the smart scissors.